Back in 2013, Jason Bateman made his directorial debut with Bad Words. 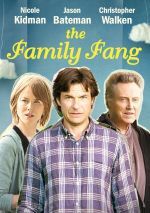 It didn’t make much of an impact at the box office, but it looks like The Force Awakens compared to his second effort behind the camera, 2016’s The Family Fang. This one barely received any theatrical exhibition and wound up with a mere $260,000 – ouch! If he gets a third shot, perhaps Bateman will enjoy box office success at that time. Despite its low commercial profile, I wanted to give Fang a look. Famous performance artists Caleb and Camille Fang (Christopher Walken and Maryann Plunkett) disappear. To solve this mystery, their adult children Baxter (Bateman) and Annie (Nicole Kidman) come together and work as a team. This leads them into a variety of circumstances, some of which force them to confront dormant issues from their unconventional childhood. On its surface, Fang provides an interesting twist on the family dynamic. We’ve seen scores of films like this in the past, tales that focus on adults who come to terms with the impact of how their parents raised them. Given the extreme nature of the Fangs’ “art”, though, this turns into an altogether different dynamic in the film. As depicted here, Caleb viewed his kids as little more than pawns in his “pieces”, just tools to be used for his own ends. As intriguing as that notion becomes, the movie doesn’t do a lot with it. We see that Annie and Baxter went into the arts themselves but they end up unfulfilled. Annie became a famous actress but her career is on the wane and she gets stuck in crap films. Novelist Baxter produced one good book but bombed with his second effort and can’t get past writer’s block for the third. Unsurprisingly, Annie and Baxter’s attempt to deal with their parents’ disappearance kicks them out of these doldrums, and it feels like a cheat – partially because the movie wants to have its cake and eat it, too. From start to finish, it paints Caleb as something of a monster – we see that he never really cared about his kids as anything other than part of his “art”. He comes across as wholly unsympathetic and a terrible parent. At the end, though, the film wants us to see the ways in which his methods succeeded, mainly because his final “work” puts Annie and Baxter back on track. In addition, we see a repudiation of his wholesale awfulness as a parent. I recognize that life is more complicated than simple “good or bad”, but I still view this as an untenable compromise, largely because the film really does depict Caleb as an awful person. At no point does it soften his edges – indeed, the more we learn about him, the more terrible he seems. Camille doesn’t come off much better. Because she long ago had to subjugate her own artistic needs to serve her monomaniacal husband’s ego, she earns some sympathy, but not much. Camille still put Caleb’s desires ahead of what was best for her kids, so she seems just as complicit in these actions as Caleb. Had Fang really delved into the longterm impact Caleb’s “art” had on the kids, it might be more interesting, but it tends to stay on the surface. We can see that Annie is the more cynical of the two, and her attitude makes sense. Caleb’s work depends on fraud, so it seems logical that she would find it difficult to believe the “truth” behind anything Caleb does. When your father lives his entire life in “boy who cried wolf” mode, it’ll give you trust issues, and Annie embodies those. To a degree. In truth, Annie’s cynicism stays skin deep and acts more as a plot device to contrast her with the more resigned, trusting Baxter. No matter how much “artistic abuse” his parents imposed on the kids, he still seems to believe they’ll do what’s best – a position that seems to exist solely for dramatic conflict. As the older child, Annie bore more of the brunt of the “art”, but I still find it hard to accept that Baxter would be so accepting of the ways his parents manipulated him. These factors create intriguing subtext to Fang but the actual narrative can seem meandering. The movie seems more like a story concept than an actual full-blown tale, so it remains sketchy. Parts of it threaten to become engaging, but the end result never gets there. This doesn’t make it a bad movie. Fang comes with just enough substance to keep us with it, as we do wonder how the efforts will resolve. I just think it could benefit from greater depth and characters who do more to interest us. The Family Fang appears in an aspect ratio of approximately 2.40:1 on this single-sided, double-layered DVD; the image has been enhanced for 16X9 televisions. The picture never excelled, but it was acceptable for SD-DVD. Sharpness was usually fine. Wider shots tended to be a bit soft, but those instances weren’t extreme, and much of the flick offered decent to good clarity. Shimmering and jaggies were minor and edge haloes seemed non-problematic. Print flaws were non-existent, as I detected no specks, marks or other blemishes. The film’s palette usually opted for a mild teal or orange tint. Within that design range, the colors seemed passable; they weren’t especially strong, but they were okay. Blacks tended to be somewhat inky, but shadows showed reasonable smoothness. Nothing here did much to impress, but this was an acceptable presentation. Don’t expect fireworks from the film’s Dolby Digital 5.1 soundtrack, as we got a mix heavy on music and general environmental material. Even when the material broadened, it stayed restrained and effects could seem borderline monaural. This became a restricted track for 5.1. Audio quality was fine. Speech seemed natural and concise, and the score demonstrated pretty good vivacity. Effects did little to tax my system but they were clear and accurate enough. Overall, this ended up as a passable mix. The DVD comes with an audio commentary from actor/director Jason Bateman. In this running, screen-specific chat, Bateman looks at story/character areas, cast and performances, music, editing, camerawork, sets and locations, and a few connected domains. Overall, Bateman delivers an average commentary. While he manages to touch on a decent array of topics, the discussion never really turns into anything involving. Bateman offers a serviceable overview and that’s about it. The disc opens with ads for One Last Time and Tumbledown. No trailer for Fang appears here. At its core, The Family Fang takes on an intriguing notion: the impact that a life wholly based on “art” would have on children. The movie doesn’t explore this as well as I’d like, though, so it seems only sporadically interesting. The DVD offers mostly positive picture and audio along with a decent commentary. Fang delivers moderate entertainment but doesn’t cohere enough to be great.